We've been back home for a week now, although it feels a lot longer. Arriving home to a huge pile of mail on the doormat, both the van and our car needed insuring over the last week. I also re-negotiated our broadband and phone package with BT, who finally offered a 12 month deal that was half the price we started at and cheaper than the competition - it's always worth haggling. Cathy's been busy in the garden, ripping out the 'old people' shrubs and preparing to re-design both the back and front; it's looking a lot better already. We're also doing some decorating and tile removal ready for the bathroom refit and new flooring in the hall. I'm back into the training pipeline with Mon SAR, Anglesey's Lowland Search and Rescue team, having completed an exercise to search for 'downed' trainee RAF pilots in Snowdonia a couple of days ago, and looking forward to our formal assessment tomorrow which, if the team passes, we'll then be available for North Wales Police to call out to assist with missing person searches. I have a few weeks of training to get me back up to speed, including a first aid course, land navigation and radio communications. It's also exactly a year since I retired from work, with 1 June 2017 being my first full day as a 'retired naval pensioner'! This 12 months have flown past and we've been busy, with selling and buying a house, moving to Anglesey and completing a 3 month trip in our campervan. It's been fun and we're looking forward to making the most of all this free time - how did we ever find time to work! So, on to our recent trip. This was our first really long trip in the campervan, with the longest before then being the usual annual two week holiday. We'd planned this trip for some time as we wanted to see how we'd get on living in a small metal box for several months. We left home on Monday 5 March and returned (albeit one week earlier than planned) on Thursday 24 May. Our journey took us down the Atlantic coast of France, across inland Spain to the mediterranean coast near Valencia, then along the Spanish and Portuguese coast, back into northern Spain and up through the middle of France, with a week's house sit in the Limousin area before returning to the Normandy coast. We decided to return a week early to enjoy some good weather on Anglesey and get ahead of the house and garden jobs. We learned a lot during this trip, the main one being that we don't want to over-winter in southern Spain and Portugal. This really surprised us as we thought we'd want to escape the long British winter. But the large, soulless campsites in remote locations, combined with long dark nights, made us realise that spending several weeks in our small van in those conditions wasn't for us. But we're happy with this decision and glad we came to it before incurring the expense of a long winter trip. We also felt that 3 months is too long for us. For the first time ever we felt homesick and were really looking forward to returning to our home on Anglesey. We think this is because this is the first time (in 35 years) that we were able to choose our location and home, due to my naval career dictating where we lived and I worked. But we still love travelling in mainland Europe; future trips will be a bit shorter and will probably focus on getting to know an area really well, rather than travelling widely throughout several countries. We're also looking forward to travelling more throughout the UK. We compared all we saw with the British Isles and, although we stayed in some beautiful places, it made us realise just how special our countryside and beaches are. We're already planning some short trips of a few days into Snowdonia and the Llyn Peninsula and a 2-3 week trip to Scotland in the autumn. In the meantime we have all the delights of Anglesey to enjoy, especially as the summer tourist season ramps up. The island has changed a lot since we left, obviously much greener (and warmer!) but also loads of cafes, tourist sites and places of interest are now open. 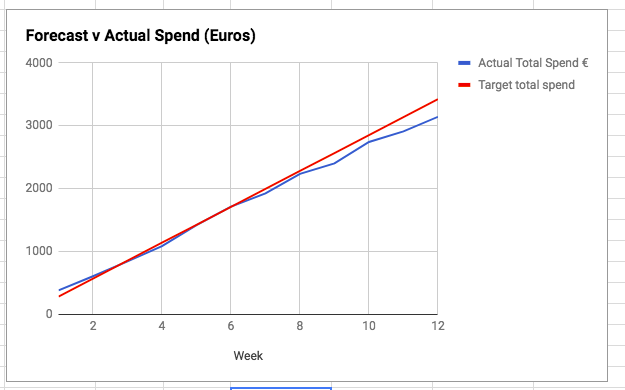 I've always been interested in the logistics and costs of a long term campervan trip and spent many hours researching other blogs, estimating budgets and managing finances. The details of our trip are below. 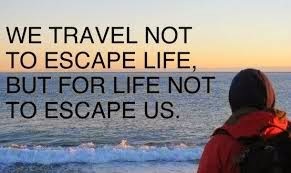 Everyone is different, so our budget and costs are unique to us and are not indicative of everyone's travels. We ate out rarely, preferring to buy good produce in the local stores and markets where possible and eat in the van. We also made the most of free overnight stops, plus a one week house sit to give us a break from the van and enjoy more space, long hot showers and access to a washing machine! We crossed the channel via Eurotunnel. It's more expensive than ferries, but we used Tesco vouchers to reduce the cost. We mainly stuck to non-toll roads, except for some travel in Portugal as the other roads were in a dreadful state and a couple of short stretches on our fast, late-notice run up to Calais when we decided to bring our return home forward. Where possible we also avoided motorways, preferring to stick to the equivalent of A and B roads. This was a slower way to travel (which we prefer) but also meant we saw some lovely small towns and villages that would otherwise have passed us by. I used two cards. Mostly it was a Halifax Clarity card as it uses a favourable daily exchange rate. The card is set up to automatically pay off in full each month and was accepted in just about everywhere, except one campsite. For cash, I used a CaxtonFX card, which I pre-loaded with Euros - topping up as required via their app - and used to withdraw cash from ATMs. These more than covered our needs. I'd previously set us up with Revolut cards, which is another pre-paid card as a back-up, but we never used them so I closed these accounts when we returned home. I also had a Tesco credit card and Santander debit card as back ups, but never need to use them. It's worth noting that if you have a Santander current account in the UK, who can use the debit card to withdraw Euros in Spain with no additional charges. Diesel prices varied significantly and was our second biggest expense. Spain was the cheapest, where I found diesel at one station at only €1.09 per litre. France was the most expensive and now more than the UK, in some places an eye-watering €1.62 per litre! Portugal was between the two. 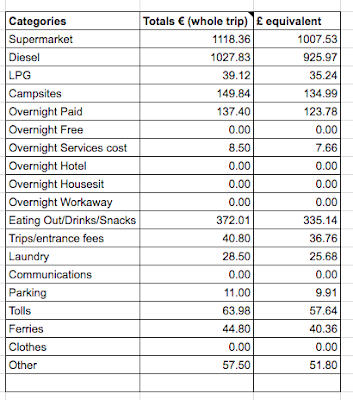 LPG was relatively cheap at an average of €0.66 per litre. I filled up every fortnight and took onboard an average of about 10 litres each time, which ran our fridge, gas hob, BBQ and hot water. I also found filling up easy with the various adaptors. In Spain many of the fuel stations provide an assistant to fill up diesel and LPG for you. Not surprisingly (at least for us! 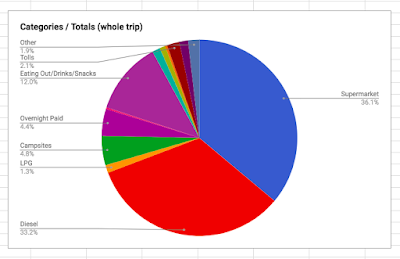 ), food was our biggest expenditure. We used local markets and supermarkets where possible, but also used Lidl, Aldi and some of the more expensive hypermarkets such as Intermarche (the most expensive supermarket) and Carrefour. We bought local food items, steering clear of 'British' products, although we didn't take enough British tea-bags with us and the local equivalent wasn't up to standard! Eating out is a matter of personal taste and budget. We preferred the smaller village bars for simple tapas or pizza. Over the years we've been disappointed at the standard of restaurants when eating out, so avoid them now and mainly cook in the van. We avoided the 'English breakfast with a pint' deals in the Costas! In fact the best meal we had was a vegan lunch between Tarifa and Cape Trafalgar in Spain - delicious. We also enjoyed the chicken and chips for breakfast when blocked in by the local market in Portugal! Alcohol is very cheap in Europe and there's a wide variety of wines and beers everywhere; it's possible to buy a litre of wine for €0.89 in Spain. We went teetotal about half way through the trip so this no doubt cut our costs. I'd been thinking about stopping drinking alcohol for many months but, like a diet, it always starts tomorrow. But a realisation that alcohol was playing too large a part in my life, plus the opportunity to sit back and think about it on this trip allowed me to stop drinking. I've not missed it and have discovered some lovely fruit cordials to mix with sparkling water and 'virgin G&Ts' (with a slice of lime and crushed juniper berries that we picked on our walks). The heavy daily drinking amongst the 'snowbird' population over-wintering in southern Spain and Portugal also turned me off alcohol - they were wrinkled on the outside and pickled on the inside! So - cheers to a healthier lifestyle. Door to door, we drove 5,985 miles (9,631 kilometres). 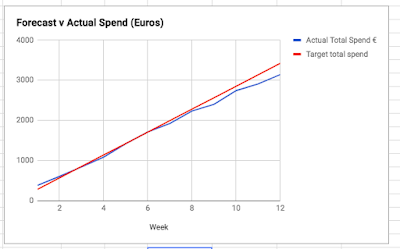 €3,143.15 (£2,831.61) in total over 80 nights.